Ghaziabad: It’s a great news for investors and buyers to invest in a good project of BCC that is Bharat City comes with the philosophy of people first culture .BCC and HDFC PMS comes with the joint venture of delieving the results in respect of amenties, square footage as specified. 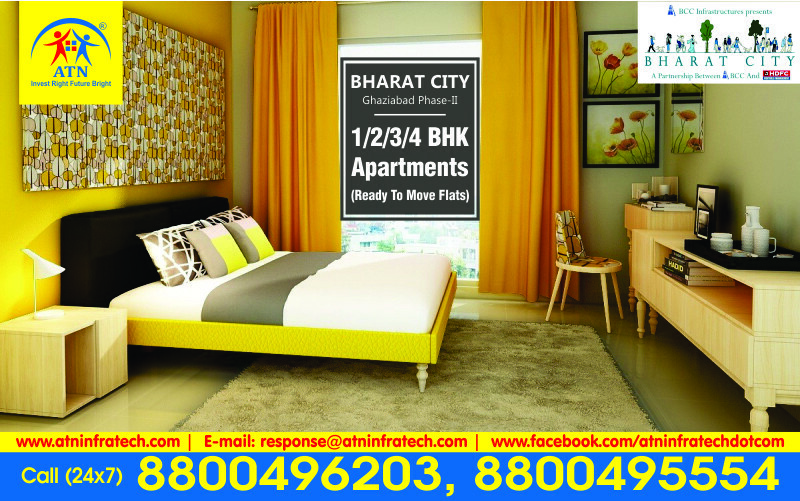 The Bharat City apartments comes with the developed Phase I project approximately 300 families are settled presently . Phase I -II in Ghaziabad is a growing projects with many families residing and many more is in line of passion till Diwali. Bharat City apartment comes with all the modern facilitees.Here Residential are enjoying all the access to schools hospitals, sports ,grocery stores,mall,cultural center etc. The BCC brings with Power Packed Package which brings many sailent features like sports facilities,segregation between vehicle and pedestrian spaces, entire power backup,2 level security system with intercom, exclusive elevated park with car, sufficient open parking for residents. 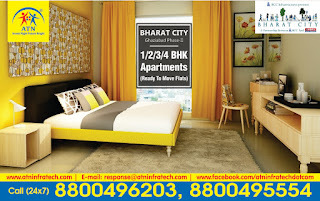 The Bharat City Flats available with options of 1 BHK covering total area of 635 sq. ft.,2 BHK covering total area of 825 sq. ft.,2 BHK covering total area of 1050 sq. ft.,2 BHK covering total area of 1155 sq. ft.,3 BHK covering total area of 1375 sq. ft., 3 BHK covering total area is of 1475 sq. ft.
Construction is covered with earthquake resistance RCC frame structure as per seismic zone -V with latest formwork technique,Wall finish is completed with OBD paint,flooring is décor with vitrified tiles,celing is completed with OBD paints. Modular Kitchen is design with anti ceramic tiles,ceiling is completed with OBD paint,wall is been cover with 2 feet designer tiles,fitting is of granite counter fitted with stainless steel sink. Fittings is of white sanitary ware with EWC, CP fittings External Facade Finish is design with wall finish is of double coat plastered finished with elastomeric paint. 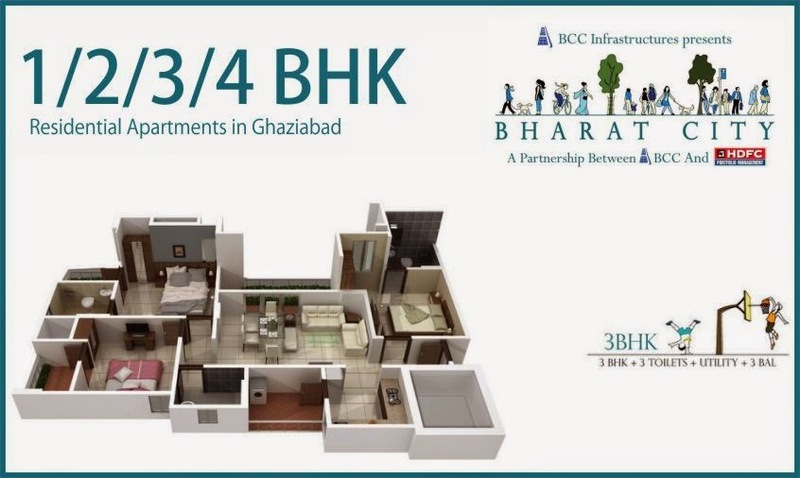 Conclusion:- Bharat City apartments are available in phase I-II of Ghaziabad location with all the luxury and amenities this project comes with collaboration of BCC & HDFC PMS and their vision of delivering projects on time with all the amenities. Don’t you wish to live amidst lush greenery, peaceful surrounding without wasting time to travel the city? Then look no further Indraprastha Ghaziabad, which are just a few kilometers away from New Delhi offers attractive housing project of Bharat City built on the concept of People First. Bharat City Phase II: The Bharat City Phase II Ghaziabad is an integrated walled township spread on 50 acre area of green surroundings with plentiful facilities and amenities. This residential project is getting a lot of popularity proffering 1, 2 and 3 BHK apartments with individual terraces and balconies in floor plans of 635 Sq.ft, 825 Sq.ft, and 1050 Sq.ft and 1155 Sq.ft and 1475 Sq.ft at affordable costs. All homes are beautifully designed with RCC earthquake frame, cross ventilation and optimum utilization of natural light with luxury designs on floors, ceilings and walls. Location: Bharat City which enjoys the location in Indraprastha Ghaziabad which is well connected to all the major cities like Delhi, Noida, Greater Noida, Gurgaon and Faridabad. Close to Dilshad Garden Metro Station, GTB Hospital, Railway Station, ISBT, Schools and Shopping Malls, families will be never away from any facility. Lavish Amenities: Bharat City housing has basic securities, water supply, power back up, swimming pool, yoga and clubhouses and many more. The BCC Infrastructure Group is well known for delivering the first class homes. The gated community lacks nothing, from large open and green spaces are allotted for every building, excellent ventilation and daylight schemes in all apartments, rainwater harvesting facilities, two tier security system, proper drainage and sewage disposal facility, 100% power back-up, covered car parking facilities, Crèche and a Bal Bharati Public School etc. Rainwater harvesting and in house maintenance facility keeps the colony clean, beautiful and functional. Bharat City Ghaziabad offers attractive homes in your budget. What are you thinking? Build your dream homes for families. If you are searching for the ready to move home on a budget, you have come to the right destination. 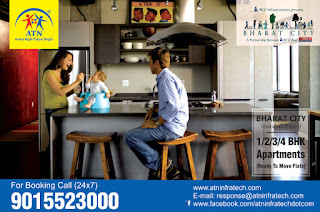 “ATN InfraTech” is a one stop source to search the NCR’s best residential property. Our company has a vast list of the home listing including the amazing and outstanding apartments, & flats in the range of 1/2/3/4 BHK as well as studio apartments, penthouses as well as luxury villas. In the current scenario, Bharat CityGhaziabad phase II presents the promising ready to move homes. The best-in-class facilities for the urban living and its affordability make the beautiful abodes of the Bharat City Ghaziabad Phase II a dream housing destination of the home-seekers. Avoid the hassle of finding the land and hectic process of the selection of the layout and construction and shift into the ready to move abodes beautifully build with all the high-end amenities that ensure the relaxing and refreshing life at home. The attractive and modern residential building of the Bharat City is strategically developed near Hinddon Airbase. The whole township enclosed in expansive veggies makes it a pleasing destination to reduce all your daily stress. The best facilities and technologies used in developing and decorating the every unit just add a touch of style in lifestyle. People can choose the best property available in options of 1/2/3/4 BHK depending upon the particular needs and budget limits. Among the 5000 models of home in Bharat City Phase II in Ghaziabad, you can search your dream home with “ATN InfraTech” in an effortless way. Besides the opulent residence, we are also offering the attractive deal and discount on its booking. Moving to one city to another due to job prospective has become a common thing for many urban professionals. Delhi NCR in India is one of the favorite choices to work and live among the majority of working professionals. Worldly amenities and better living facilities of the city leave a lasting impression to the individuals. Do you get migration in NCR from the office? Do you want to live a better life? Are you searching ready to move in homes? If the answer to all such questions is yes, then you should book your dream abode in Bharat City Phase II Ghaziabad. 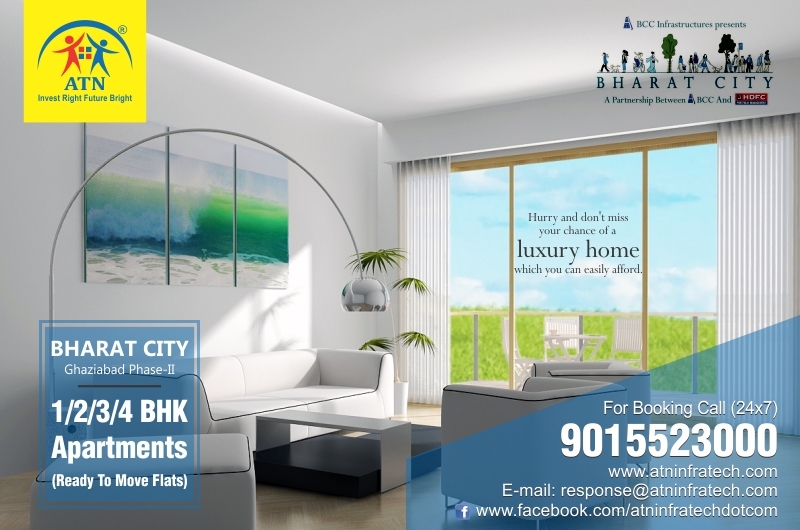 Bharat City is the new housing venture that is thoughtfully designed by the BCC Team and HDFC PMS. 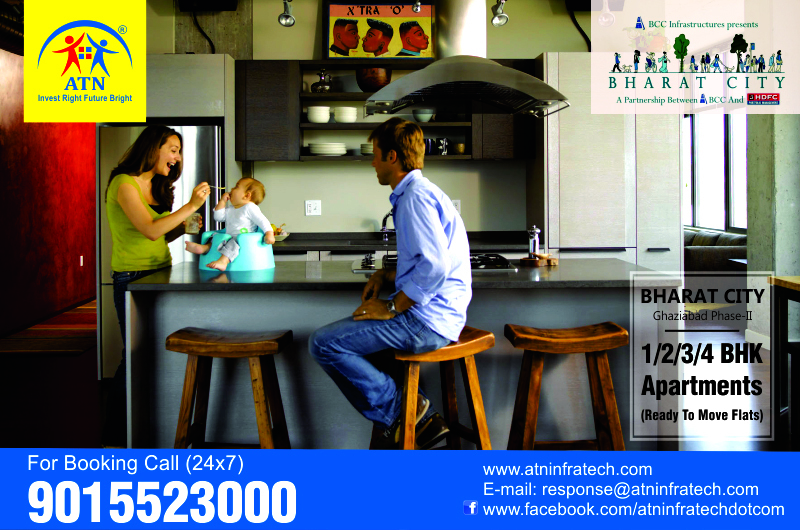 You can book a premium property within your budget in Bharat City with “ATN InfraTech”. Having an abode in this residential tower means a life in modern home amidst expansive veggies and peaceful ambiance. This brand new housing tower an Indraprastha Yojana in Ghaziabad near Hinddon Airbase and constructed with the best facilities and technologies available today. With “ATN InfraTech”, it is possible to book personal apartments available in options like 1/2/3/4 BHK without burning your pockets. Our company comes up with the opulent modern homes, including ground property so you can make your personal choice for the dream abode. Among the 5000 models of the projects having several choices in sizes and layouts, you just get the best of the house among all that are offering the authentic joy of residing. At “ATN InfraTech”, our aim is to make available the dream property to our clients in the fastest way with quality assurance and within the budget. Keeping this in view, we are offering several luxurious homes in the prime location to book that in budget friendly rates. For the booking of the ready to move in homes in Bharat City Phase II in Ghaziabad, we are offering attractive payment plans such as Subvention Payment Plan, Construction Linked Plan and Cash Down Payment. Now, you have no need to take stress about searching and buying your dream home in Delhi NCR since we are here available to help you for the end-to-end needs.